Over the years I have been in the unfortunate circumstances to have to work with birds and animals in emergency shelters. It can be heartbreaking and rewarding all at the same time. However let it be known, that you have an opportunity to make a difference in a sad situation. But let me warn you. It is not easy, and there are rules you must follow if you decide to go down this path. This series will not be humorous, and may sound clinical, but I feel it to be necessary. I have heard from those who say they truly want to make a difference, well this is that chance. So here we go…. Why would there ever be a need for a Bird Shelter one may ask. Besides the obvious of a Disaster (Natural, or Manmade), other reasons for an emergency shelter may include a hoarding case, a criminal case of cruelty and neglect at a rescue, or an emergency evacuation for health and safety reasons. In this series we will discuss everything that it takes to set up, operate, and manage a bird shelter. First let’s discuss a shelter that will be because of a Raid, or Hoarding Case. In this instance it is Important to remember that this will end up in fact being a “Court Case”. As either a Volunteer, or Staff member of any operation, you will most likely be under the control of a Humane Agent or Animal Control Officer, you will need to remember there are rules you will need to adhere to when working at a shelter. The Humane Officer or AC is the one person who is responsible for making sure that all is done correctly in any investigation. The Shelter Manager is one who is wholly responsible to ensure that the Shelter Operations run smoothly. They are to ensure the animals are cared for, records are kept, food and supplies are cataloged, managed, and are maintained. They are also responsible for shelter security. They also oversee Staff and Volunteer co-ordination. Anything that comes into question in regards to the shelter is their responsibility. A Veterinarian may be on call to the shelter to deal with medical needs. As a volunteer you may or may not be called upon to treat or medicate a bird, depending on your experience. If you are, make sure you understand all instructions, and follow them exactly as given. If you are not comfortable with doing something, say so. If you have never done it before make sure the Vet, or Vet Tech observe you doing it, or show you how to properly administer any drugs or meds. If you cannot properly and safely restrain a bird, then I suggest you don’t volunteer to medicate a bird. There may be a Volunteer Coordinator whose job is to see that volunteer staffing occurs, and that all volunteers are trained and understand their responsibilities so that there are no incidents that go unchecked. They must make sure that all animals in the shelters care are fed, watered, and have clean housing. They are also responsible for making sure all the volunteer adhere to the rules. They report any incidents that may occur to the Shelter Manager. The Volunteer is the one who will do the hard work. They are responsible to ensure every animal is cared for, they will feed, water, and clean the housing, and most importantly make observations to ensure the animal is as happy and healthy as possible during this period. They must report any changes in the animal’s status, to the volunteer coordinator immediately, if the coordinator is not available, then to a Staff Member or Shelter Manager. Basically there is a Chain of Command that must be maintained as to ensure that nothing is missed. This is to ensure that the case of the Humane Agent runs smoothly as it goes forward into the Court System. Anything, that is not done correctly can be detrimental to the case it’s self. 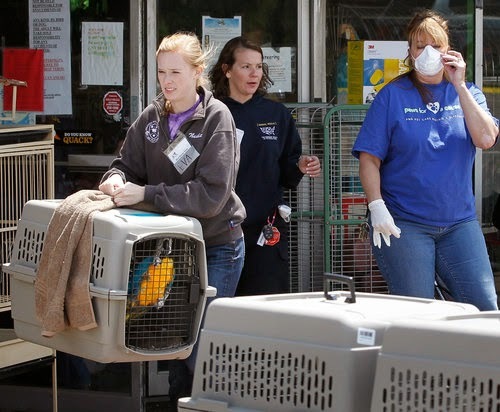 During a Disaster Operation all the above will apply in most cases for those working directly with animal care. The difference is there will be a layer of Command Structure above the Humane Agent / AC that will most likely not affect you as a Volunteer, or even as a Staff member. Remember the structure of the chain of command is there, and must be followed to ensure the safety of the animals in your care, and the safety of the animal care providers. I always suggest taking courses offer by several entities if you think working in this area of animal care is of an interest to you. .
Now these Courses maybe required for you to assist in an Animal Shelter in either instance of Disaster or Civil case depending on the situation, and requirements of the state, county or local rules. I always suggest Red Cross training in the following especially working with animals. Shelter Operations, while mainly for Humans it will give you a good idea, and grounding into shelter operations. All of these courses available at local Red Cross Locations at different times.